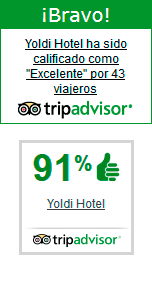 The Hotel Yoldi, located right in the heart of Pamplona, offers spacious and peaceful well-appointed double rooms. Each room features a modern, refurbished en-suite bathroom, air conditioning, strong box, mini-bar, TFT LCD TV with connection for your PC and Canal Plus, in addition to completely free WIFI to allow you to browse the net with your smart phone, tablet or laptop. With no restrictions or costs. We also offer a late check out service, just in case you need to leave the hotel after 12:00 hours on your check-out day (with a 15:00 hours deadline, provided that the hotel occupancy allows this and subject to request). And if your pet follows you everywhere, then there’s no problem; it can continue to do so at the Hotel Yoldi, because pets are welcome.